The exam is conducted once in a year. Here, we have mentioned the NEST 2019 complete details. 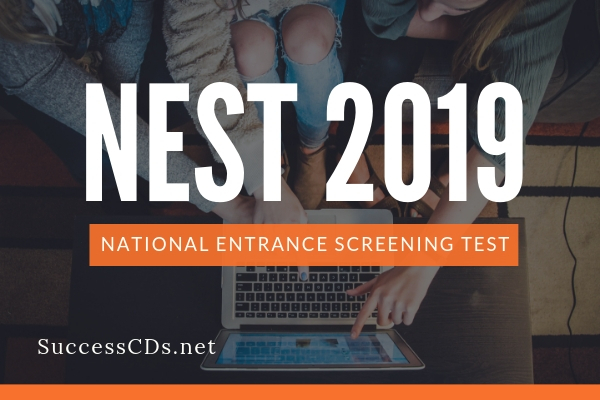 National Entrance Screening Test (NEST 2019) is a compulsory test for students seeking admission to National Institute of Science Education and Research (NISER) Bhubaneswar and University of Mumbai - Dept. of Atomic Energy Centre for Excellence in Basic Sciences (UM-DAE CEBS), Mumbai. NEST 2019 will be conducted in around 90 towns and cities all over India on 01st June 2019 (Saturday). Both NISER and UM-DAE CEBS were set up by Dept. of Atomic Energy, Govt. of India in 2007. University of Mumbai - Department of Atomic Energy Centre for Excellence in Basic Sciences (UM-DAE CEBS) Mumbai. Candidates seeking admission to NISER & UM-DAE CEBS for the integrated M.Sc. Program 2019 should be from regular Science Stream only and preferably should have any combination of three subjects among Biology, Chemistry, Mathematics and Physics in classes XI and XII. It is mandatory for all aspiring candidates to write the NEST 2019 exam; admission will be offered strictly on the basis of Merit List of NEST-2019. Additionally, candidates must have passed class XII exam or equivalent from any recognized Board in India in the years 2017 or 2018 or be appearing for the same in 2019. Candidates who are appearing for the board exam in 2019 must pass it by the time of admission. Also, candidates must secure at least 60% marks in aggregate or equivalent grade in class XII exam to be eligible for admission to NISER and CEBS. For candidates belonging to castes SC/ST & PD categories, the minimum requirement of marks is relaxed to 55% in aggregate. Where only letter grades are available, a certificate from the concerned Board specifying equivalent percentage of marks is required to be submitted. In absence of such a certificate, the decision of the admissions committee of the concerned institution will be final. For the integrated M.Sc. Program 2019, the total number of seats at NISER and CEBS are 170+2(JK) and 45+2(JK), respectively. Indian nationals belonging to certain categories are admitted under the seats reserved for them in accordance with the rules of the Govt. of India. Other Backward Classes belonging to the Non-Creamy Layer (OBC-NCL) 27% of seats are reserved for OBC-NCL. Person with Disabilities (PD) - 3% of seats are reserved in every category, i.e., General, OBC–NCL, SC/ST; benefit would be given to those who have at least 40% impairment irrespective of the type of disability. Candidates must choose 02 (two) centres in order of their preference while filling up of application form. It is allowed to select two centres from the same city, such as Delhi–East and Delhi–North. Every effort will be made to allot the centre of first preference. Please note that ultimately the allotment of an exam centre by the Chief Coordinator has to be regarded as final and request for change of centre will, in general, not be entertained. The address of the test venue for any centre will be mentioned on the NEST admit card. Candidates are permitted to attempt as many subject–sections as they wish. However, only the best three subject–scores along with the score in the general section will be counted for evaluation and merit list preparation. The answers to each question are to be marked on an OMR (Optical Mark Recognition) sheet. The NEST 2019 Exam will be conducted at 90 centres (major towns or cities) all over India on 01st June 2019 (Saturday), 10.00 am - 01.00 pm. Based on the performance in NEST 2019, a common Merit List of the candidates will be prepared and posted on NEST 2019 website. The successful candidates will be asked to participate in an admission/counselling process and the admission will strictly be according to the Merit List. The question paper will consist of 5 (five) sections of objective (MCQ) type questions. Section 1 is the general section and is of 30 marks. There will be no negative marking in the general section. Sections 2 through 5 are of 50 marks each and will contain subject specific questions from Biology, Chemistry, Mathematics and Physics. The syllabus for NEST 2019 primarily follows the NCERT/CBSE science syllabus of class XI–XII. The syllabus can also be downloaded on the www.nestexam.in website under the ‘Syllabus’ tab. To apply for NEST 2019, candidates must fill–up the online application form through www.nestexam.in on or after 07th January 2019. Candidates are strongly advised to read the detailed online application procedure available on the website. Online application process closes on 11th March 2019. There is no offline application mode available for NEST 2019. For detailed information on NEST 2019 application procedure and previous years’ questions papers, please visit NEST 2019 website www.nestexam.in.